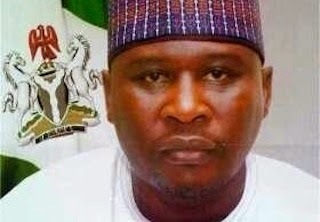 The Peoples Democratic Party, PDP, has disqualified the Acting Governor of Adamawa State, Umaru Fintiri, from contesting the state’s October 11 governorship election as its candidate. The PDP said Mr. Fintiri, who took over as acting governor after the impeachment of Governor Murtala Nyako in July, is ineligible to participate in the party’s September 6 primaries. The Chairman of the party’s screening panel, Ibrahim Mantu, who briefed reporters at the end of a screening Saturday, said Mr. Fintiri was disqualified on “moral grounds”. Mr. Mantu spoke at the national secretariat of the PDP in Abuja. Acting Governor Fintiri has faced mounting criticisms over his decision to contest the election to replace Mr. Nyako, whose removal he spearheaded. Other PDP candidates for the poll have accused him of staging a “coup” and lacking the moral right to contest. On Saturday, loyalists of the ousted governor vowed to present evidence showing Mr. Fintiri had decamped to the APC.